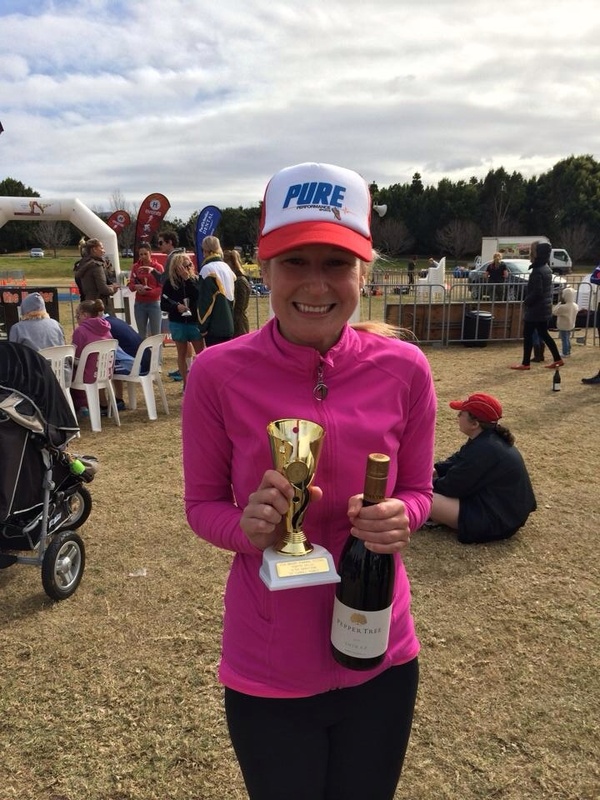 The inaugural Hunter Valley Ultramarathon was held on Sunday 20th July, as part of the Winery Running Festival. I had participated in the marathon for the last 2 years, but can never go past the chance to participate in the ‘inaugural’ anything, so I lined up for the ultra. It was a 4am alarm, and a long drive out to the Hunter Valley. I was expecting chilly pre-dawn conditions, so I was dressed in track suit pants, ugg boots, and a snow jacket. When I got there, it wasn’t that cold. I picked up my race number, handed in my drinks for the ‘special needs’ table, and contemplated running in my ugg boots, before changing into my running shoes. 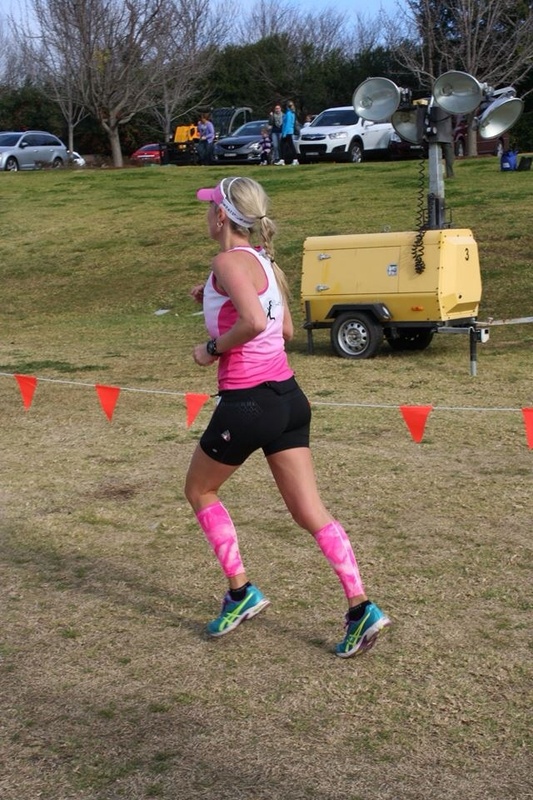 I had bought a throwaway jacket and gloves to wear at the start of the race and throw away when I warmed up, but it wasn’t too bad so I decided to leave them behind. We were away right on time, at 6:30 am, half an hour before the marathon kicked off. For the Ultra (52.5km), we would be running 2 laps of the half marathon course, and then the 10.3km course to finish it off. 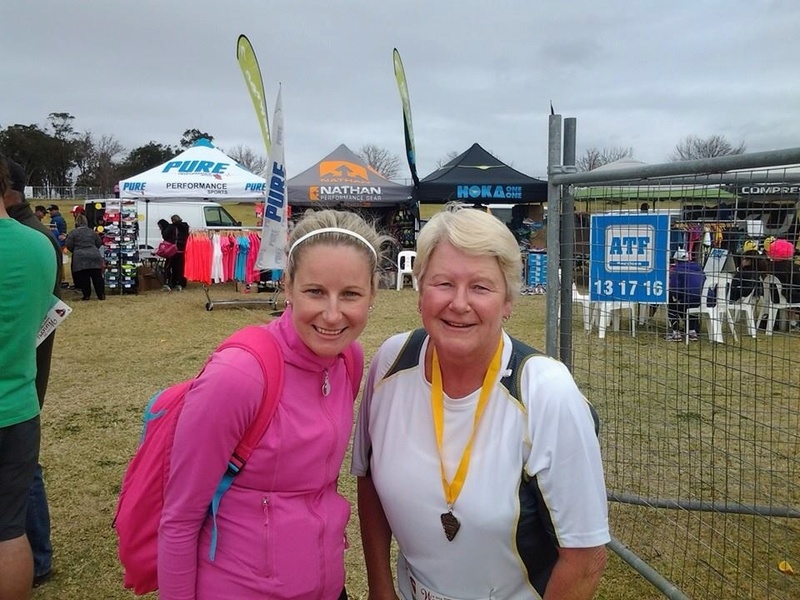 I chatted to the people around me at the start, and soon found myself running alongside Cory Newman, who I had decided would probably win this race when I heard that she was running it. She is a multiple-comrades finisher, and is super-strong at this ultra distance stuff. Although I knew who she was, we had never officially met, so we introduced ourselves. This marathon course is far from flat, but there is only one hill that really bothers me: the ‘Audrey Wilkinson’ hill, located about 4km in. This year, I would have to run up it 3 times. The first time up Audrey was not too bad. Running back down the other side was fun. The first 20-30 km seem like a bit of a blur. I was running with Cory, we got into a good rhythm. We were making good time. As we approached the turnaround, the lead male passed by in the other direction. I started to count the runners as they passed. It confirmed what I was thinking: that we were the lead females. On the way back I passed a few familiar faces of friends doing the marathon. It was nice to receive their encouragement. Cory and I completed our first lap (half marathon) in 1 hour 49 minutes. As I ran through the chute, I heard the announcer call our names. I saw a table to the right covered in cups of water. Our special needs table must be just ahead. Last year it was just up here to the left…. No table. I must have missed it. I had a 250ml bottle of Gatorade with 2 GU’s taped to it to get me through the second lap. I’d have to go without it. I had no GU left from the first lap. I’d have to rely on the tables. I scanned the crowd for familiar faces… Mum… Dad…. Richard… I saw no-one. The second time round, we smashed that hill. Looking back at my km splits after the race, you can’t even tell where the hill was. we didn’t slow down. A DJ in a tent was playing music near the top of the hill. I was really looking forward to a drink of Gatorade at the top, but they only had water. At the next few drink tables, I took a cup of Gatorade and a cup of water: The Gatorade was for drinking, the water went over my hands and face because I spilled the Gatorade everywhere. I had no idea of how fast we were running, how long we had been running for or how far we had to go. I just concentrated on running along with Cory, and the time went by really fast. I was in a good rhythm, and running with someone else made it so much easier. I knew that if she dropped off, or got ahead of me, my pace would slow. There was less chat on the second lap… We were working hard. 40k’s in, Cory was still running strong. I thought we might be in for a sprint finish. I wish I hadn’t run a marathon only 2 weeks ago. I decided that I was more than happy with second place. The first person I saw on the sidelines was Nicole Elliot, who asked me if I needed a gel. As I yelled out that I was fine, I tossed her my arm warmers. I ran past Kara, who was yelling out ‘Winner Winner’, and then I ran past Rich. I felt like crap. (He later told me I looked awful too). The marathon was complete in 3:33, nearly 12 minutes faster than my time from last year. The second lap was 5 minutes faster than the first lap. And I still had 10km to go. Running through the vineyards the third time, I glanced over my shoulder. Cory was right behind me. She would probably catch me on the hill. I had already drunk all of my Gatorade. I had a gel, and stopped at the next water station to fill my bottle with water. I didn’t want to keep running, but I did. The road was winding. Sometimes I could see Cory behind me, sometimes I couldn’t. If she overtook me on this hill, I didn’t think I had the strength to go with her. In my mind, whoever made it to the top of that hill first had the race won. That was the finish line for me. Just. Be. First. Up. The. Hill. I don’t even know how I managed to keep running the entire way up that hill. ‘I HATE AUDREY WILKINSON’ played over and over in my head. My legs felt like jelly and I felt very lightheaded when I reached the top. I recovered with a quick kilometre on the downhill. Time to bring this race home. An older couple drove past, and jokingly asked If I would like a lift as they rolled on by. I said yes, but they didn’t stop. i couldn’t have timed it better If we planned it that way. As I ran into the water station, Pip and Kellie were approaching it from the other direction, finishing off their marathon. We both had about 4km to go. ‘Run me home? !’ I called out to them. ‘ We’ve got nothing’ replied Kellie. So on I ran. A few minutes later I saw Sarah up ahead. I ran up to her and said hello. She ran along with me for a few minutes, then asked what pace we were running. I glanced at my watch. “4:50” I replied. “I”m going to let you go…” She said. So I powered on. The end was in sight. By this point, I was passing a lot of walkers. I did not have the energy to run around them. Everything hurt. I just yelled out ‘coming through’, and it was never a problem. As per the rules, nobody was wearing headphones. It was actually really helpful to me at that point. I reached the car park, and knew there was only about a kilometre to go. We had to run on the grass here. My tired legs really wanted the firmness of the road, and were glad when they finally got it. Along the path for the last time. I yelled out that I was coming through to a girl in front of me. She turned and saw that I was wearing an ultramarathon race number. “Well done, only 10k’s to go!” She said as I ran past. Thank god that was not the case. I could see the end. I passed my dad, cheering on the sidelines. I don’t think he realized I was winning. The night strider cheer squad were standing near the top of the finish chute to bring me home. I was so glad to finish that race: I was spent. 4:28:36. So happy to be done. Cory crossed the line a few minutes later, along with Sarah, Pip and Kellie. 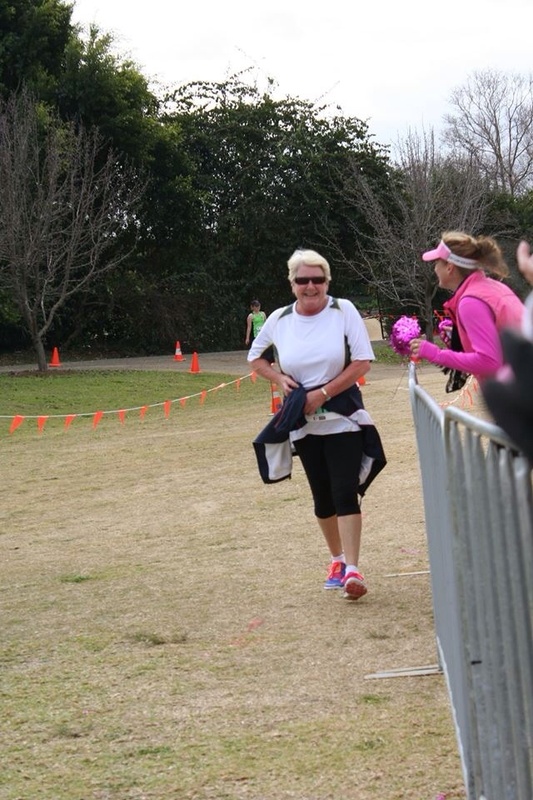 Then it was my mum’s turn to run the 5k. Sue in the ‘Winery Wander’. It started to get a little cool waiting around for the presentation. We were lucky not to get rained on. Now that I have had a taste of what winning a race feels like, I hope that I can do it again someday! 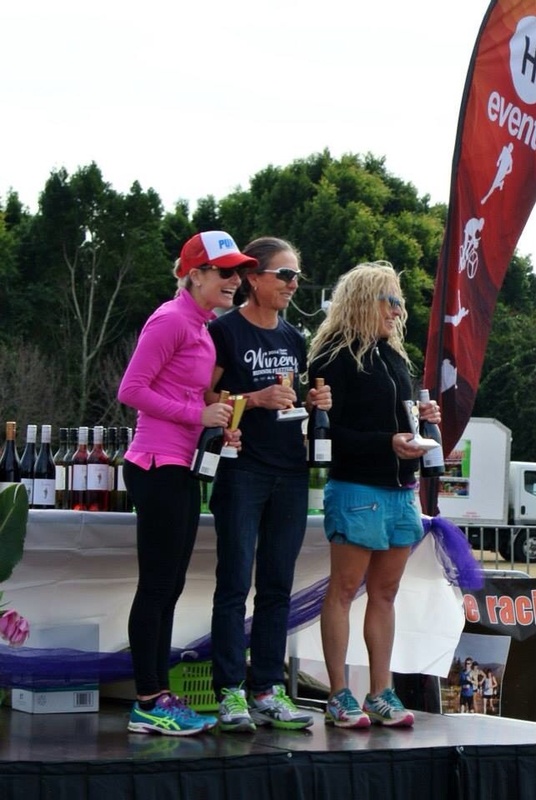 Hopefully in a race where first prize is more than just a bottle of wine. As it was the inaugural Ultramarathon, I would also like to lay claim to the course record! Even if I only get to hold it for a year. Kirby, all I can say is WOW! Well done. Good to see you back on board, thought you were suffering a bad case of writer’s block.Good win, if anyone deserved that you did. Not a case of writers block… Just too many things, not enough time! Another great read kirbs, your races just keep getting better ! Congratulations ! Congrats on the win. My legs ache just thinking about that long of a run – kudos to you for getting it done! Thankyou! It wasn’t easy, but was worth it at the finish line!